Growing up in a big Polish family, kielbasa and other smoked sausages were a frequent (and favorite) part of many family meals! 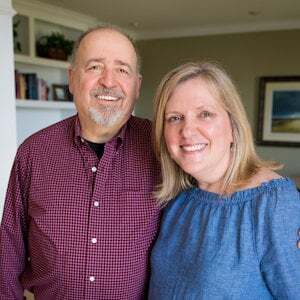 Kielbasa is ‘in my blood’ – and today – it takes just one bite and I’m happily reminded of my childhood dinners. 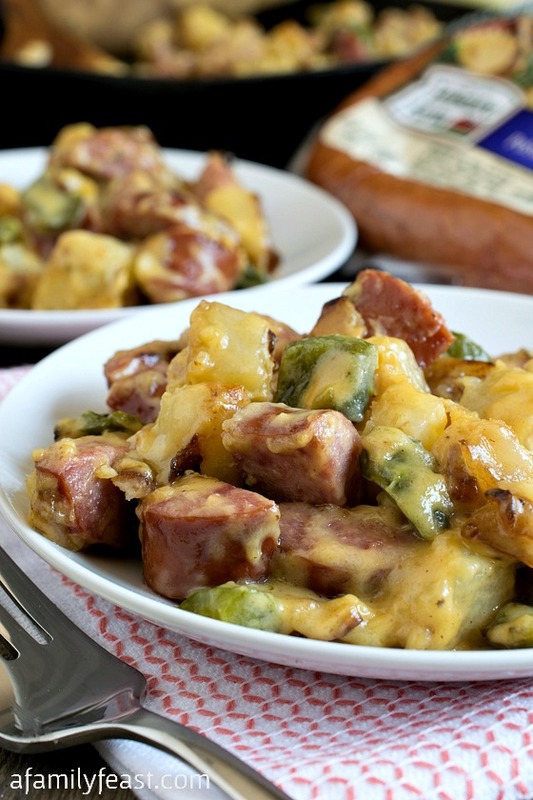 So I am incredibly excited to partner today with Hillshire Farm and Ahold USA to share this easy-to-prepare, delicious Cheesy Smoked Sausage Skillet recipe with all of you as part of their Smoked Sausage #SausageSoSimple program! 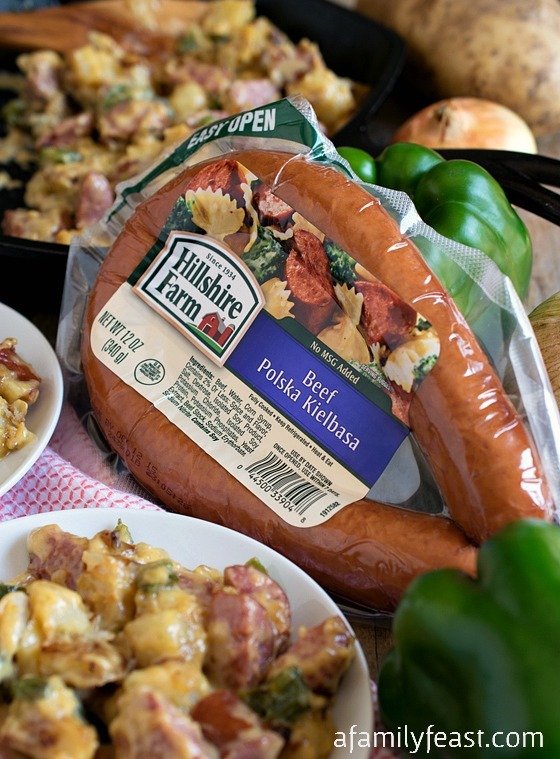 Hillshire Farm is our go-to brand anytime we buy smoked sausage and kielbasa. And all Ahold USA Supermarkets (including Stop & Shop, Giant and Martin’s grocery stores) carry all of the brands I trust in a friendly, convenient atmosphere. I shop there because I know I will find all of the ingredients I need to prepare quick meals that my family loves. 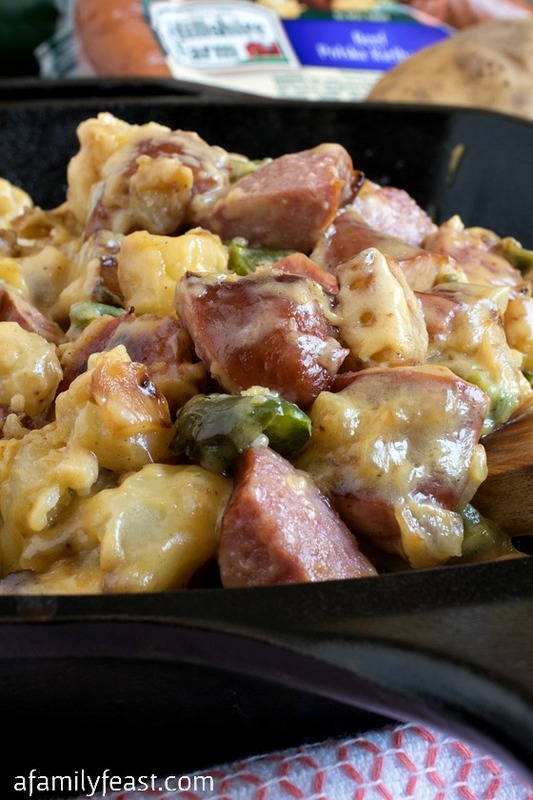 Our recipe today uses Hillshire Farm Beef Polska Kielbasa – but any of Hillshire Farm’s other delicious smoked sausage products would be great in this Cheesy Smoked Sausage Skillet. 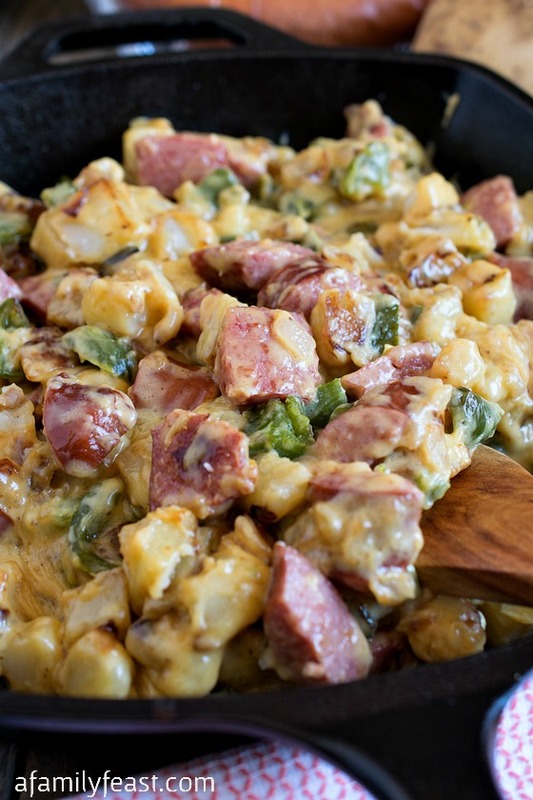 Simply sauté diced russet potatoes, onions, and green bell pepper in a skillet – then add in your favorite sliced Hillshire Farm Smoked Sausage. Finally, pour a simple and cheesy sauce over the top – and dinner is ready! 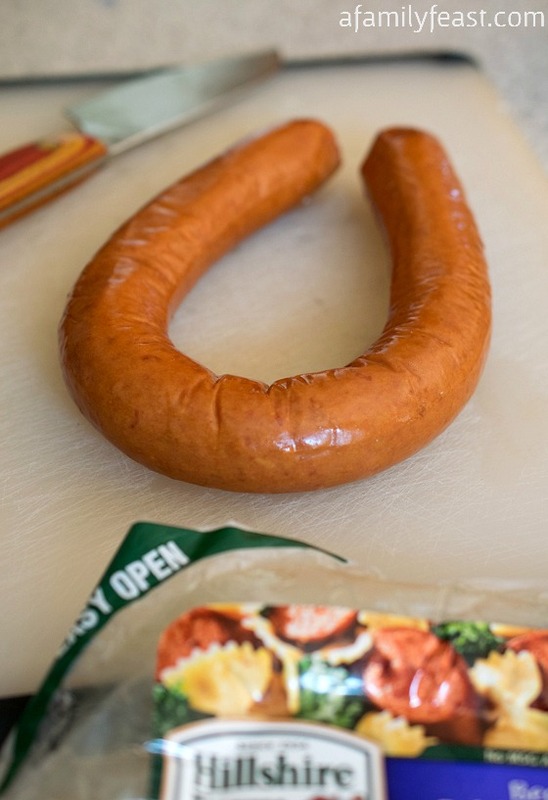 Hillshire Farm Smoked Sausage is pre-seasoned, so even if you haven’t cooked with smoked sausage before, it adds quick, foolproof flavor to any recipe. 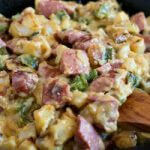 This Cheesy Smoked Sausage Skillet is pure comfort food with fantastic flavor. And – even better – it only takes about 30 minutes to get a delicious and filling dinner on the table for your family! Additional disclaimer: My husband Jack is an employee of Ahold USA but this has no way affected the opinions stated here. Peel and cut potatoes into one-inch dice and place in a bowl of water. Let sit in the water until the other ingredients are prepped and you are ready to cook. 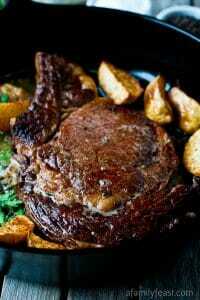 In a cast iron skillet, melt two tablespoons of the butter with the olive oil over medium high heat. Drain the potatoes, then add to the skillet along with the diced onions. Cover and cook for five minutes. While potatoes are cooking, place milk, American and cheddar cheese, salt, pepper, mustard and nutmeg in a microwave-safe container and microwave for 90 seconds on high. 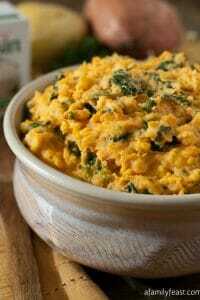 Whisk the mixture together and microwave again just until the cheese melts and a cheese sauce is formed. Remove from the microwave. Hold for later. Add the remaining butter and green pepper to the potato mixture in the skillet and turn and mix using a spatula. Cook for 8 minutes turning occasionally with the spatula, or until the vegetables are tender. Add the smoked sausage, cover and reduce heat to medium. Cook for two minutes covered and turn off the heat under the skillet. Pour cheese sauce into the skillet and stir to coat. Serve immediately. Recipe is great. 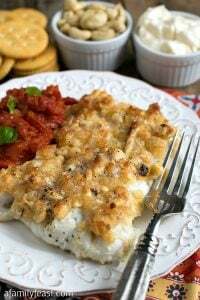 We substituted the potatoes with turnips and used one boneless chicken breast and 6 oz. of the kielbasa. It was delicious. Could I somehow make this on the crock pot? Hi Heather – We’ve only made this as written. 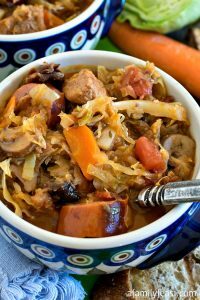 It only takes 30 minutes to prepare on the stovetop so I’m not sure about a long and slow cooking time in a crockpot, but you could certainly keep it warm in one if you’d like. Hope that helps! This was delicious! I made some modifications based on my diet (ketogenic), what I had on hand, and my own mistakes (lol). Instead of potato, I used 200g small cauliflower florets and threw it in there at the same time as the peppers and onion. I added the kielbasa a little bit after, and sauteed it all on medium-high to get some nice color on there. For the sauce, I accidentally added 1/2 cup cheddar (haha but who’s complaining?). I didn’t have white pepper or dry mustard like I thought I did, so along with the salt, I added black pepper, a touch of smoked paprika, garlic powder, and just a dash of prepared mustard. It turned out wonderfully. Thanks for the awesome, quick recipe- I’ll definitely use it again. Glad you found a way to make the recipe work for your diet Kat! Thanks for letting us know. Mmmm…I made this for dinner tonight. Family loved it! I used Hillshire Farm SmOkey Bourbon smoked sausages and also used broccoli slaw and mushrooms. Yum! I decided to try this recipe and it has great potential. The issue I had was that the only seasoning is in the cheese sauce. This works fine except for the potatoes. Next time I am going to soak the potatoes in salt or a chicken or beef broth. Other than that, this recipe was very delicious. 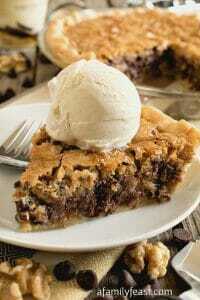 I want this for supper tonight! This looks amazing! Oh my, that sausage and cheese looks fantasitc! I would love this over a huge bed of pasta! Even though I have absolutely no Polish ancestry, I love Kielbasa. And the brand I always purchase is Hillshire Farm. 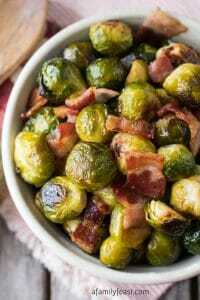 Putting it on my shopping list now so I can make this delicious recipe for tomorrow. I hope you enjoy the recipe Lana! I could totally see why this is comfort food for you. You make the most comforting looking food! I loved Hillshire Farm outlets in the malls when I was a kid. Holy smokes. I want to dive into this head first!! 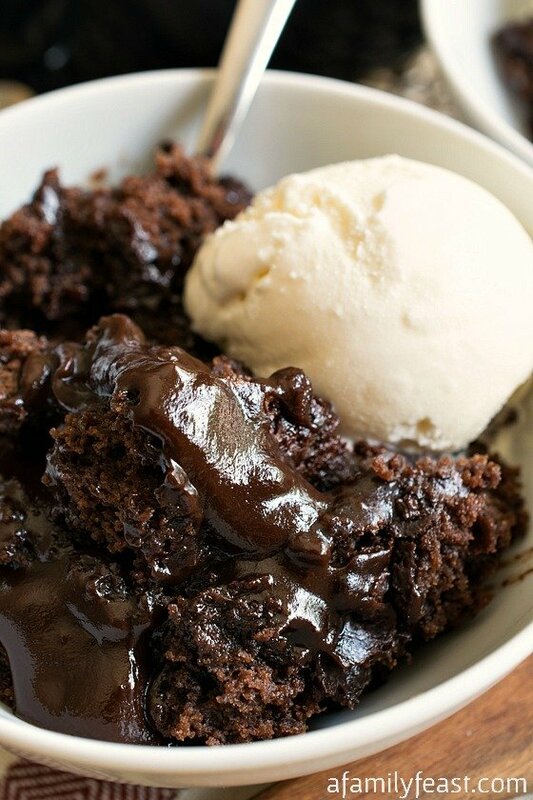 My mouth is just watering all over. This looks creamy and delicious! Woah. 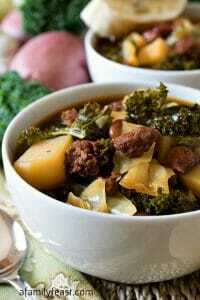 Talk about comfort food! Great recipe! This is pure comfort! My Dad’s side of the family is Polish so we grew up eating a lot of Kielbasa. I could say and spell kielbasa before I could practically spell my very long Polish (maiden) name. LOL.